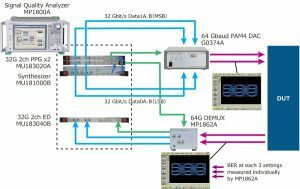 The system consists of an MP1800A signal analyser, a G0374A 64Gbaud PAM4 2-bit DAC and an MP1862A 56Gbaud demultiplexer. 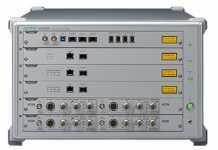 Anritsu’s test system generates PAM4-modulated data streams at speeds up to 64Gbaud, or 112Gbps. 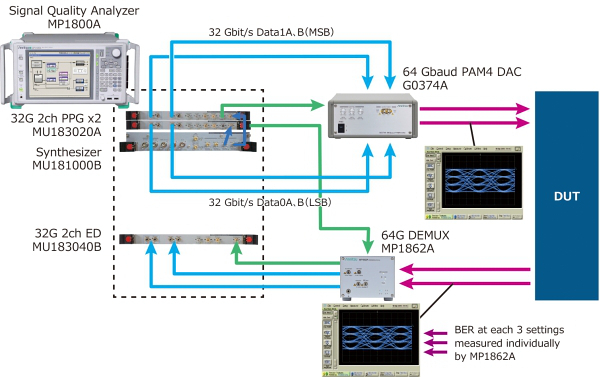 The system can analyse signals for 400GbE up to PAM4 56Gbaud. 400GbE standards define backplane communications that consist of four lanes at 100Gbps each. For data centre use, optical cables will carry 400GbE using 16x25Gbps lanes. 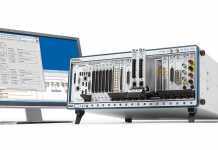 Figure 1: The test system consists of an MP1800A signal analyser, a G0374A 64Gbaud PAM4 2-bit DAC (digital-to-analog converter) and an MP1862A 56Gbaud demultiplexer (64Gbaud with MP1862A-001). The MP1800A is the system mainframe that consists of an MU183020A 2x32Gbps pulse-pattern generator module and two MU181000B synthesiser module for generating PAM4 signals. The 4×32 or 4x28Gbaud streams combine in the G0374A to form a single 64Gbaud or 56Gbaud signal for testing receivers or backplanes. Signals from the DUT are demultiplexed by the MP1862A and go to the MU183040B, an error-detector module in the signal analyser for BER (bit-error-rate) measurements. Although the system is capable of generating 64Gbaud PAM4 signals, its BER capabilities are limited to 56Gbaud. But, that’s all you need for testing today’s 400GbE data streams. The system will generate a clean three-eye PAM4 signal so you can see how it degrades when passing through the DUT (connectors, cables and PCB traces). The MP1800A lets you adjust signal skew. For testing receivers, you might need to add jitter. Anritsu product manager Hiroshi Goto explained to me in a phone call that you can add a jitter module to the system that will let you add random jitter, sinusoidal jitter, deterministic jitter and bounded uncorrelated jitter to transmitted signals, but that requires a second mainframe. Although PAM4 is gaining ground, not everyone is using it. 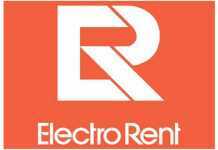 Some systems use 56Gbaud (56Gbps) NRZ (non-return-to-zero) modulation. Thus, the system also supports NRZ.